THESE DOES EARNED ELITE DOE STATUS IN DECEMBER 2018! Sprinkls at 2 days old. 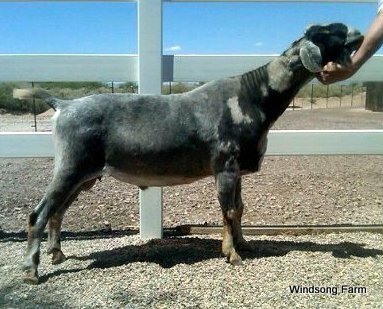 Sprinkls as a yearling. There isn't anything we don't like about this young doe, including her sweet personality. Looking forward to seeing just what this combination of genetics will do, both in the milk parlor and for our herd. Sprinkls as a first freshener, 19 days fresh. Sprinkls' first freshener udder, 19 days fresh. 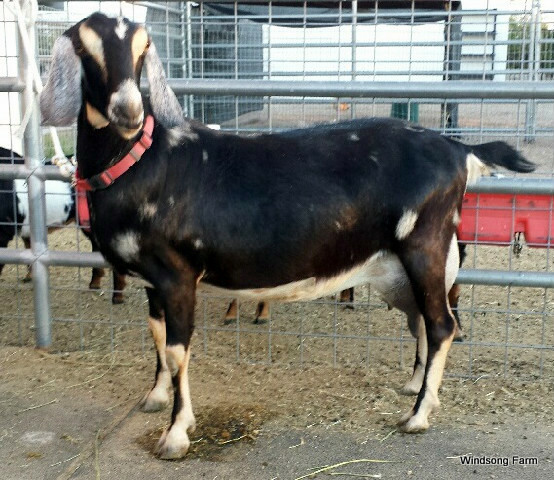 Sprinkls' dam's udder: Six M Galaxy Hope's Chocolate 16*M at nine years old. Stormy as a three year old. Legacy's Alpha s1 Casein A/B report. Legacy as a first freshener. Legacy's FF udder at 30 days fresh. Legacy's 2F udder at 30 days fresh. Thank you Veteran's Ranch for use of your photo of Snowflake. Thank you Crow's Dairy for the use of your photo and test result for Comet. Waffle as a yearling, 6 days fresh. Waffle's dam, Enya, was sunning herself one windy day. She was carrying quads and she was ten days away from her kidding date. Enya was laying beside a 3-piece section of steel pipe cattle panels and the wind was so strong it blew the panels over... on top of Enya... squashing her FLAT! I heard the crash from inside the house and went running. Enya looked like the Wiley Coyote in one of his "splat" modes. The panels were so heavy I could barely lift them high enough for Enya to rise. Enya held her kids and had a normal delivery ten days later... and although the kids were not squashed flat, the name "WAFFLE" sounded about right for this doeling. Waffle has been freshened as a yearling. Waffle's Alpha s1 Casein is A/A by parentage. "Waffle's Alpha s1 Casein is A/A by parentage.﻿"
Chocolate Cherry at four months. G6S Normal by test. 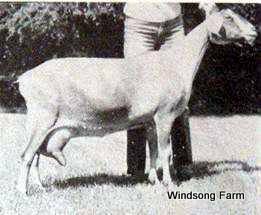 Cherry as a dry yearling. Chocolate Cherry's Alpha s1 Casein A/B report. Java as a dry yearling. Thank you Flying S Bar and Six M Galaxy for use of your photos! Sushi as a dry yearling. Sushi's dam's udder, 17*M Flying S Bar Dark Chocolate. ﻿17*M Flying S Bar Dark Chocolate's Udder﻿, rear view. Dark Chocolate's Casein A/B report. Charlotte at 3 years of age.. Flying S Bar Charlotte's udder. Chrissy at 5 years of age. Sonia at 3 months of age. When viewing the ADGA pedigrees, be sure to click on "format this page for printing" and scroll down to see milking records and linear appraisal information, or click on blog links under an animal's ADGA link for information about parent performance. Please use our "Contact Us" page to find out more information.